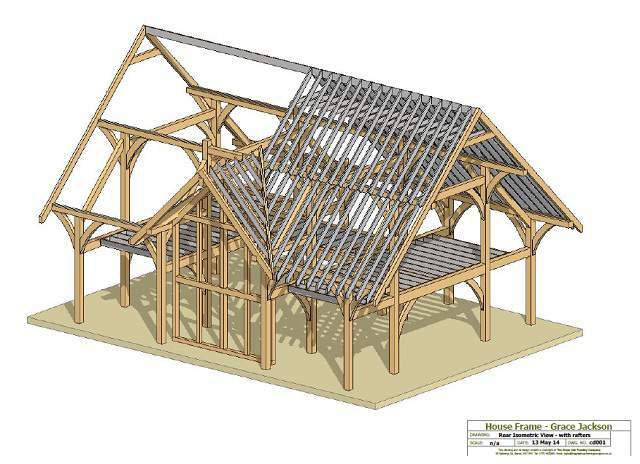 The house was designed by me, with a lot of input from a lot of other people along the way, as is always the case with these things. 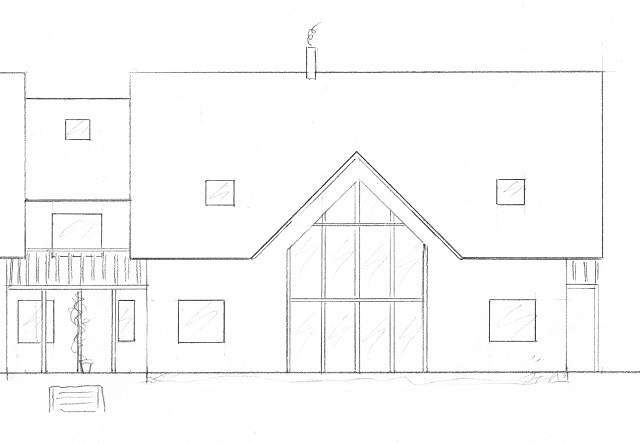 Having never designed a house before, I’m pretty pleased with my first go, although it did turn out alarmingly big. 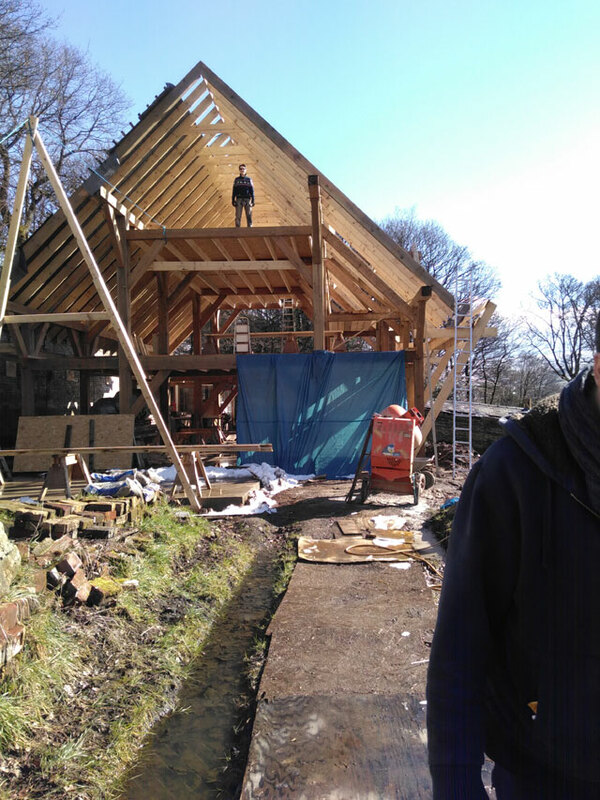 The picture above did have a whole other wing of house to the left (the West wing) which was going to be a workshop or dance space. That isn’t going to happen anymore; the house is big enough as it is. We plan to have a lovely garden instead. 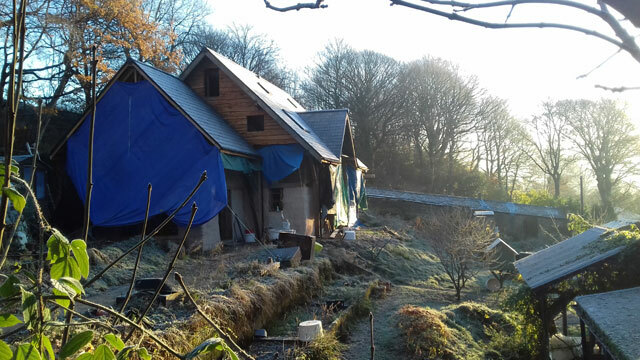 From September to December 2015 we framed and raised the main house. The labour was done by me and a team of volunteers (thanks to Ben, Phil, Helene, Ruth and Rory) with a range of experience levels, led by Nick Freydag of the Green Oak Framing Company, and Craig Thompson, a highly skilled and experienced young timber framer who, while he lacked much leadership experience, stepped up to the mark beautifully and was indispensable to the project. 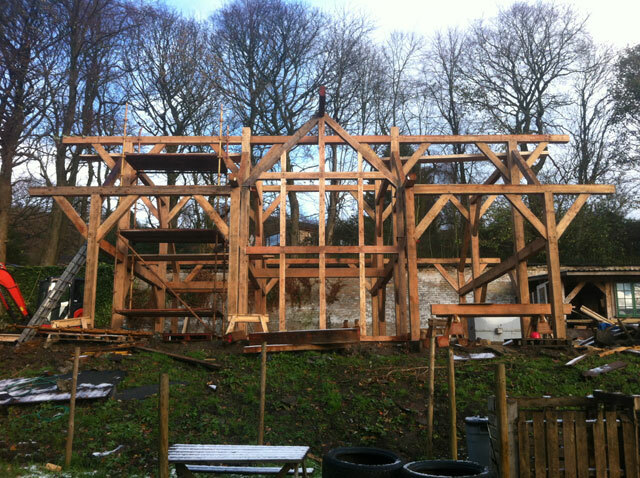 Once the main frame was up Ben Duxbury stayed on to help us get the principle and common rafters up. 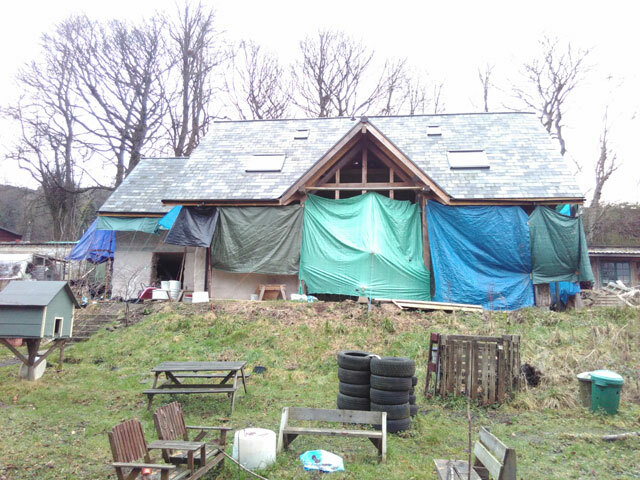 We also put all the roofing felt on in order to keep most of the rain off the straw as it arrived. Ben has been one of our most dedicated volunteers and was especially helpful at this time. 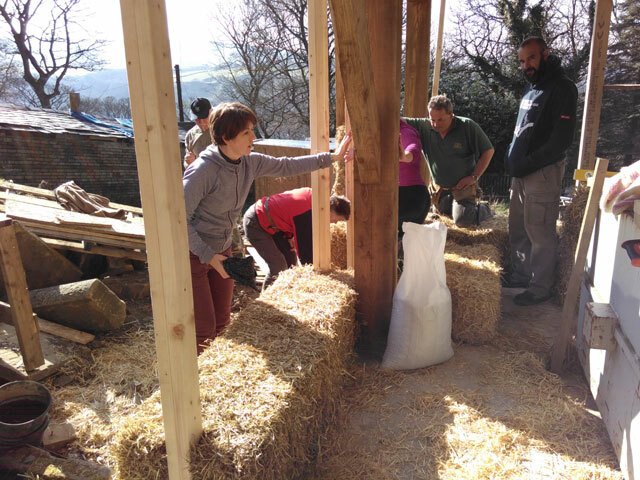 In March and April 2016, we hosted two straw bale wall building courses run by Straw Works. 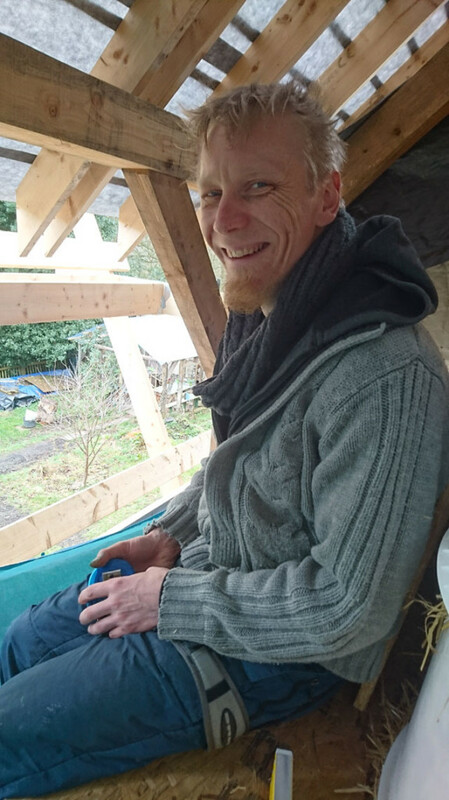 During the straw bale course Ben was also on hand making the box beams as fast as we needed them. The walls are only partially rendered at the moment as winter came along before we could finish. The render we are using was made in February 2016 in an old bathtub and left to mature for a few months. The sand and horse hair is added immediately before using it on the walls. The rest of the roof also went on over the summer. The tiles are all reclaimed fibre cement slates which our good friend Andy acquired for us from a building he took down. Thanks to David, Mac, CJ and James for their agility and swiftness in getting the tiles on. 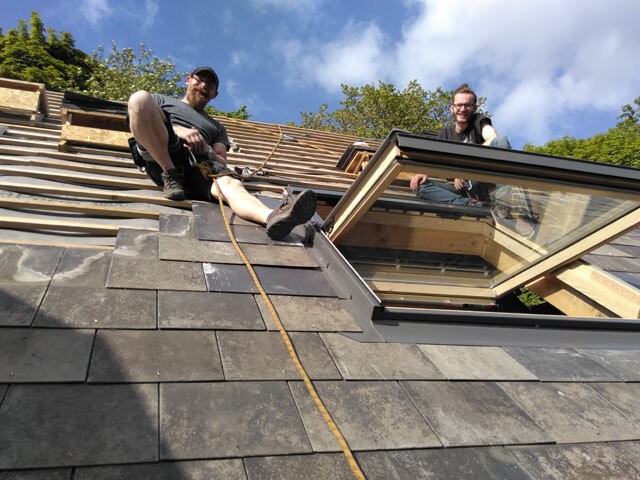 It certainly wasn’t the most comfortable of tasks, especially on the South facing side of the roof when in full sun. 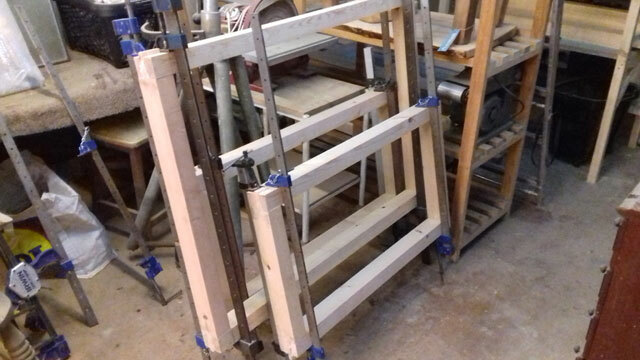 At the moment I am working with my excellent carpenter friend Nora on the window frames. We already have all the double glazing units which Antony gave us (one of many acts of generosity). The glazing for the big front window will come later as I have to order the glass and figure out how to do direct glazing first. I am really enjoying this return to carpentry. 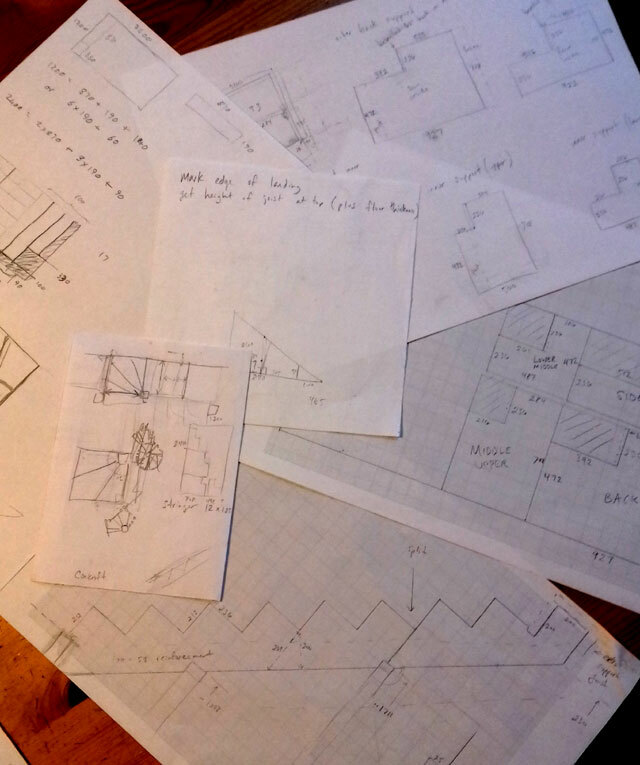 I’ve also designed the staircase and bought all the wood for it. This will go up whenever I have the time. 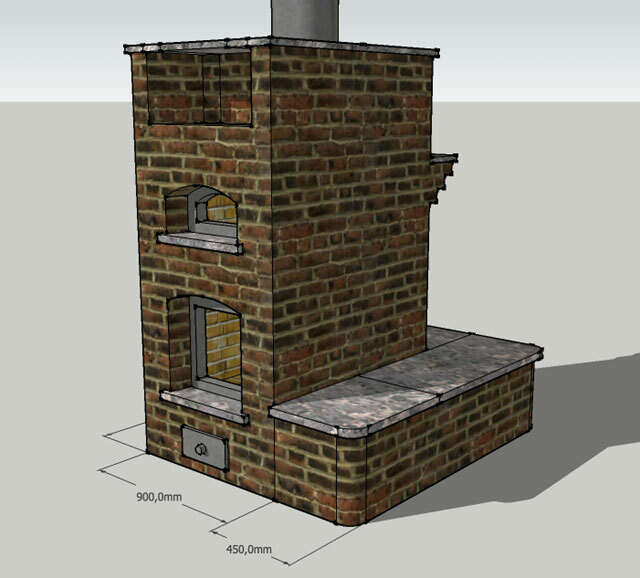 Finally, at the end of March we have booked a guy to come over from Norway to build our masonry heater. 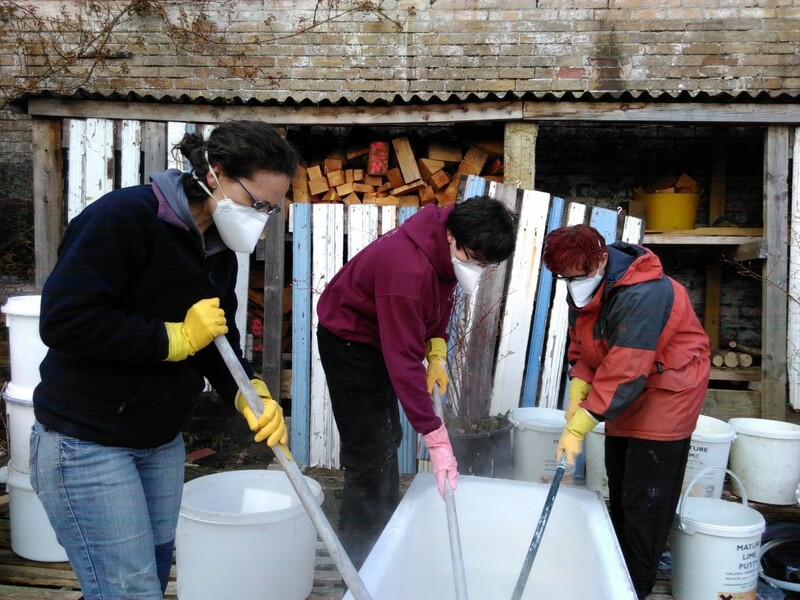 If you’re interested in being involved with the build, please look at the volunteering page, as we are always looking for volunteers with a keen interest in what we’re doing.